The loss of a dear friend or loved one is never easy. One way to dampen the blow of sorrow and mourn effectively while also moving toward healing, is to plan a meaningful cremation service, honoring a loved one. A cremation service that fits the wishes, values, and beliefs of the deceased can be a great celebration of their life. Of course, such a service looks different from one family to the next, but many families choose cremation as the most dignified and respectful way to honor their loved ones. A cremation service can be very meaningful – not just as a way to naturally pay tribute to the dead, but also as a way in which loved ones can gather, unite, grieve, share cherished memories, and even celebrate the life of the departed. A cremation ceremony, with a personalized memorial, is a great way to bring hope and enlightenment to a funeral setting. At Bradshaw Carter Memorial in Houston, TX, we stand ready to guide you through the entire process. Learn more about ways to personalize the cremation service of a loved one, or contact Bradshaw Carter Memorial to begin the planning process. The cremation ceremony is an important way to honor the deceased: To tell the story of your loved one, celebrating his or her life while respectfully acknowledging that he or she has passed on. Memorializing your loved one in a personal cremation service means selecting from various options—traditional or non-traditional services, public or private, celebratory music or respectful solemnity. Whatever kind of service you choose, we will help ensure that it fits with the wishes and the values of the deceased. 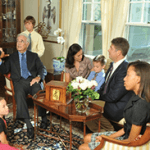 One of the most important steps in planning a cremation service is selecting the cremation casket. This is the vessel in which the life tribute of your loved one will rest—before, during, and after the service. We are happy to provide a variety of styles and many custom-made cremation caskets, to ensure you have an option that tastefully and beautifully pays respects. For those wishing to have a lasting memento of their time with the loved one, there are many choices available, including personalized jewelry and keepsake options. Memorial urns are available in many styles; these make for cherished tributes in family homes or gardens. There are also memorial options that include crushed flower petals from the service, earth from the ground, and beyond. To learn more about the cremation and memorial services that we offer, we invite you to contact Bradshaw-Carter at your earliest convenience. To add a heartfelt and individual touch, your loved one’s life story can be woven throughout the ceremony or gathering, and applied to the container, memorial urn and keepsakes you choose. There are numerous unique and meaningful personalization and customization options from which to choose. LifeSymbols Designs Added to the corners of the casket, placed in an alcove or an urn, displayed on a memory table or placed on a keepsake plaque, LifeSymbols designs are a touching expression of the spirit, personality and interests of a loved one. These popular enhancements are also used as individual keepsakes for family and friends. LifeStories Medallions LifeStories Medallions offer an elegant way to tell a life story and provide a lasting tribute to a loved one. Beautiful medallions featuring themes of spirituality, relationships and service can be added to a variety of sheet bronze and wood urns to help create a touching tribute to honor a life well lived. 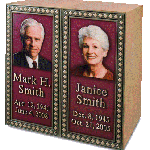 Trigard Memorial Appliqués Trigard bronze appliqués are available in three different colors, three different border options and various orientations that offer unsurpassed memorialization for urns. Appliqués and Medallions Solid bronze appliqués reflecting a variety of themes may be added to most sheet bronze and hardwood urns. Solid brass service medallions are also available. Engraved Names, Dates and Text Names, dates and text may be engraved on any sheet bronze, hardwood or marble urn. Additionally, names and dates may be engraved on the front or sides of several sheet bronze urns or on the bottom bronze plates or bases of many statuary urns. Standard Engraved Designs and Verses Standard engraved designs by Options reflect our most commonly requested images. Standard engravings have also been expanded to include verses as well as designs. Non-Standard Engraved Designs To request a theme or image ask your funeral director for assistance. He or she can help identify and select a design that meets your needs. Custom Engraved Designs Families may choose to contribute a meaningful design or photograph to be engraved on an urn. 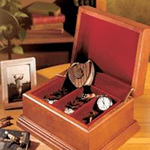 Your funeral director can help with the selection and ordering of your personal engraving. As families continue to grow and move throughout the country, they are finding that they want to create lasting, treasured memories of their loved one by sharing portions of the remains in personal mementos or uniquely designed jewelry. There are a number of beautiful options to suit everyone’s tastes – either with matching pieces or with each individual making their own choice. You may include within these personal memorials a small token of your loved one’s cremated remains, crushed flower petals from the service, earth from the burial site, or nothing at all. These unique pieces play an important role in the healing process and create personal tributes that last a lifetime.